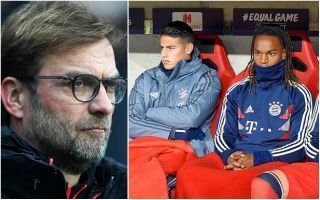 Liverpool will no doubt be on alert after latest comments from Bayern Munich attacking midfielder James Rodriguez over a potential transfer. Don Balon recently linked the Reds as lining up a £44million bid for the Colombia international, who has not looked as much of a regular for Bayern this season. The 27-year-old is still into a two-year loan at the Allianz Arena from Real Madrid, but cast doubt over his long-term future with the Bavarian giants. It’s been a tough season for Bayern, and Rodriguez has admitted the team is not as competitive under their new manager Niko Kovac. The former Monaco man also said that if he continues to not play as much then he would leave, though he stressed he is happy at the club and feels at home with the Bayern ‘family’. One imagines, however, that Rodriguez could get more playing time if he were to move to Liverpool, who look in need of adding some more spark to their attack. LFC lost Philippe Coutinho last season and never really replaced him, with attacking players like Mohamed Salah and Roberto Firmino suffering a bit of a dip in form this season. ‘It is a different situation to last season, we are not competing for as much with the new coach and so we cannot promise as much,’ Rodriguez is quoted in Marca.